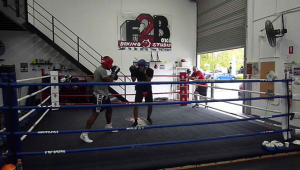 Will Christian Carto Be Philly’s Next Bantamweight Champion Since “Joltin” Jeff Chandler? Former Philadelphia WBA World Bantamweight Champion “Joltin” Jeff Chandler was 13-0-1 with 4 knockouts after his first 14 fights. His fourteenth fight was his first 10 rounder. In comparison Philadelphia’s 21 year-old Christian Carto is 14-0 with 11 knockouts and a former 2014 and 2015 National Golden Gloves Champion. He’s also been the main event boxer on three shows. Starting August 11th, September 29th and March 2nd. Photo Credit: Darryl Cobb, Jr.
On April 28th he will be fighting for the same promoter Chandler had who is IBHOF promoter J Russell Peltz of Peltz Boxing. The bout will take place at the Liacouras Center in North Philadelphia which is the home base for the Temple University Owls basketball team. It is also where both Peltz and his assistant matchmaker Brittany Rodgers graduated from. Peltz is known to give the fans what they want and put’s on very competitive fights. Carto’s opponent will not be an exception in Edwin “Puto” Rodriguez, 9-4 (5), of Puerto Rico. He is coming off a win over Juan Carlos Camacho then 6-0 (4) in August by majority decision in Complejo Ferial, Ponce, PR, over 6 rounds. In his previous loss he lost a split decision over 10 rounds to Jose Alfredo Rodriguez, then 31-4 (19), at the ABC Sports Complex in Springfield, VA, to win the UBF All America Super Flyweight title. He has a knockout win over Puerto Rico’s Carlos Rodriguez who was 12-1 at the time for the WBA Fedecentro Super Flyweight title. Carto is trained by former PA Golden Gloves Champion Mickey Rosati. He trains above Rosati’s Auto Repair Shop in South Philadelphia. Carto’s manager is his brother Frankie Jr. who was a PA Novice champion. In this writer’s conversations with Frankie it’s like talking to an old time manager. For someone so young and inexperienced you would never guess this. 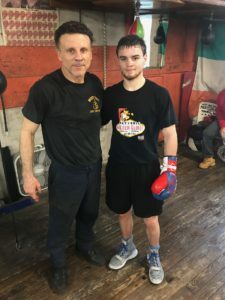 Rosati is one of the best young trainers in the business and having his boxing career in Philadelphia following his father’s career has really been a blessing. At the gym today I found out PAB HOF Mickey Sr. fell and fractured his pelvis and broke a hand. He is in the Methodist Hospital in South Philly and “fighting to get back home” with every doctor he encounters. Carto turned professional on July 2, 2016 stopping Rahkeam Parker at the Santander Arena in Reading, PA. Just 20 days later he was stopping Christopher Nelson who was making his debut at the Claridge Hotel & Casino, in Atlantic City, NJ. Carto would win 4 more fights in 2016 with 3 at the SugarHouse Casino in Philadelphia and 2 at the Liacouras Center where his next bout will be held. He would have a total of 7 fights at the SugarHouse Casino, 1 each at the Fillmore and 2300 Arena in Philadelphia, Tropicana Hotel & Casino as well as the previously mentioned Claridge making it 2 in Atlantic City. Carto’s last 3 wins have be 8 round decisions over Mexico’s Alonso Melendez, 14-1, Mexico’s Luis Fernando Saavedra, 7-3 and James Smith 12-1 of Detroit, MI. It wasn’t until his last fight against Smith that one of the judges had an opponent winning a round. KEN HISSNER: Do you know anything about your next opponent Edwin Rodriguez? CHRISTIAN CARTO & MICKEY ROSATI: We’ve seen several films on him. He looks more like a boxer than a slugger. FRANKIE CARTO: We have seen enough films on Rodriguez to know that he will be a tough test for Christian even though he is coming up a couple of pounds from his usual weight. KEN HISSNER: Do you feel you have learned more from winning your last 3 fights by 8 round decisions than your first 11 bouts by stoppages all within 5 rounds? CHRISTIAN CARTO: I believe I am learning and improving with each fight. MICKEY ROSATI: We work on new stuff and he adjusts so good it’s amazing how quick he picks things up. KEN HISSNER: This will be your third time fighting at Temple University’s the Liacouras Center in Philadelphia. Is there much difference than fighting in smaller venues? CHRISTIAN CARTO: I don’t notice the crowd so the size of the facility or crowd doesn’t matter to me. KEN HISSNER: You have fought for promoters Hard Hitting Promotions, King’s Promotions and now Peltz Boxing in association with Top Rank Boxing. Do you and your brother Frankie feel it’s good so that you can evaluate them? CHRISTIAN CARTO: My brother Frankie takes care of all of this. FRANKIE CARTO: We evaluate them and all have helped Christian’s career which is important in a young career. This keeps him in the gym. 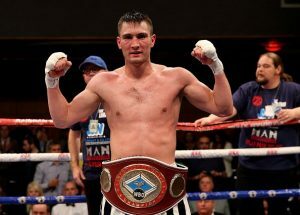 He will be having his fifteenth fight next month in twenty-two months since turning professional in July of 2016. KEN HISSNER: What is the weight set at for the fight with Edwin Rodridguez knowing he is a super flyweight? CHRISTIAN CARTO: The weight is set at 118 give or take a pound. KEN HISSNER: Who was your amateur trainer? CHRISTIAN CARTO: Tony Brisani who also trained Mickey (Rosati) in the beginning. Then Mickey came in from that point and for all my professional fights. 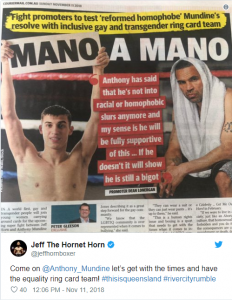 KEN HISSNER: Would you say sparring with Manny Folly also out of Philly who is 10-0 has been as tough as any of your opponents? CHRISTIAN CARTO: Manny gives me the best sparring I could get and he is as good as my opponents have been. 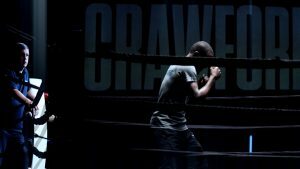 KEN HISSNER: Who have you sparred with in preparing you for this upcoming fight? CHRISTIAN CARTO: I just finished sparring with Stephen “Scooter” Felton (12-0 Philly Featherweight). KEN HISSNER: Have you signed a promotional contract as of yet? KEN HISSNER: In your last bout you had your first main event fight. In the one coming up you will be on a card with a world title bout, a pair of 10 rounder’s and be one of the four 8 rounder’s but on a much larger stage and on ESPN. Can you compare the two without yet experiencing it? CHRISTIAN CARTO: It is exciting on the same card with some good people. 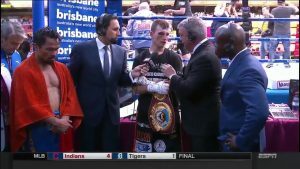 KEN HISSNER: I believe I have covered all your 14 bouts and have to say you are probably the most exciting to watch because you come with the “full package” of boxing skills and punching power. Do you feel the fans expect a knockout since your first eleven fights ended that way? CHRISTIAN CARTO: I feel I am getting better with each fight. I know it’s a learning process going from the amateurs to the professionals. KEN HISSNER: I want to thank you for taking the time out of your busy schedule preparing for your upcoming fight on April 28th. 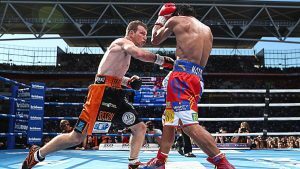 Horn (18-0-1) stunned the world when judges awarded him a surprise decision win against Pacquiao in July. 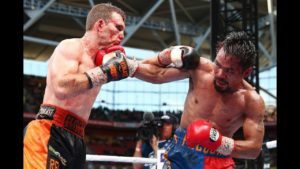 Although many – perhaps even most – felt Pacquiao won the fight, the judges’ decision, rendered in Horn’s hometown of Brisbane, made the now 29 year old Australian a world champion. Pacquiao afterwards returned to Filipino politics, where the iconic fighter works as a sitting senator. 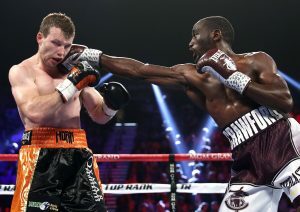 Meanwhile, Nebraska’s Crawford (32-0) unified the junior welterweight division by destroying the 22-0 Julian Indongo in August before announcing that he’d be moving a division up, to welterweight. 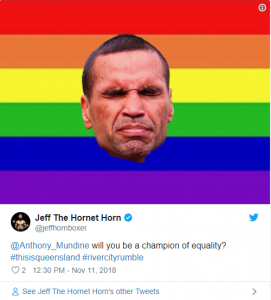 There had been word that Horn would face fellow Australian 48-8 Anthony Mundine in a homeland superbout, but a match with the more challenging Crawford clearly took precedent. 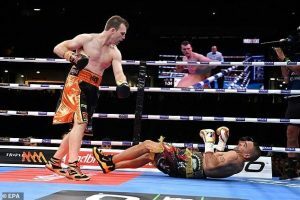 Having won a single defense against 17-1 Gary Cochoran since besting Pacquiao, Horn will be fighting in the United States for the first time, if and when the bout with Crawford (and it’s New York City location) becomes official. 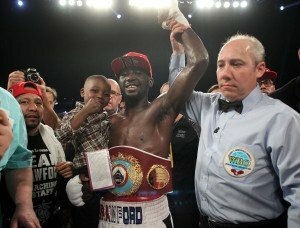 Should the planned MSG fight become a reality, it will be Crawford’s third match in the Big Apple. 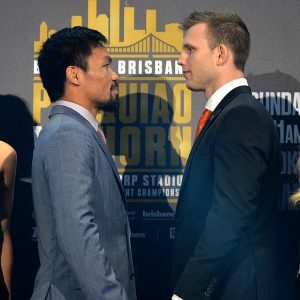 As for Pacquiao, it’s unknown who his opponent would be. 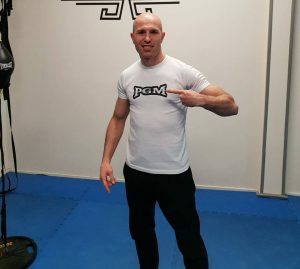 There have been rumors that the fighter known as PacMan was willing to go down in weight to fight wunderkind Vasyl Lomachenko, or even cash in on a novelty bout with UFC star Conor McGregor. Neither of those possibilities (if they even were true possibilities) appear to have led anywhere, however, so it’s a bit up in the air as to who the legendary 59-7-2 multi-titlist will face next. 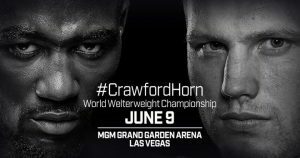 With Crawford favored to best Horn, however, there is a belief that Arum, who promotes both Pacquiao and Crawford, might arrange for the two men to eventually clash. The Madison Square Garden Horn-Crawford-Pacquiao card is expected to go down on April 14th.